Offering stability and rigidity over a wider working space the Youngman Board is an efficient, user friendly and safe working platform. Optional extras, such as toeboards and guardrails, make it a flexible and cost-effective alternative to expensive integrated decking systems. Don’t Try This With Your YOUNGMAN Board. We Can Supply A Handrail! Why Hire YOUNGMAN Boards From Lakeside Hire? Working on a construction site at height is not always a straight forward task. Very often jobs need to be carried out at height while contractors are working alongside immoveable objects such as conservatories, porches and heavy machinery. But there is an easy solution for bridging the gap over such large objects. Using Youngmans boards hire as a stable, rigid, working space means you can easily work round the immovable object on the ground beneath you. A user friendly, safe wide working platform, Youngman boards offer plenty of optional extras such as toeboards and guardrails and they make a great flexible, cost-effective alternative to expensive integrated decking systems. The best bit is that you can use a Youngman board hire to bridge the gap between scaffold towers which means even working round constructions like large conservatories no longer poses a problem. The product is lightweight and easy to use making assembly and dismantling the boards a simply exercise which can be carried out by a beginner. The Youngman board, which are also often referred to as Light Weight Stagings (LWS), can also act as an extended platform if you are working along a wall which means that you do not have to move scaffolding around, saving you both time and energy. An extra wide board of 450mm means users benefit for excellent rigidity and a full hand rail is available to keep contractors safe at all times. The Youngman board is available in three different sizes, 3.6m, 4.2m and 6m lengths and it can be used with Youngman super trestle or access towers. Youngman Boards hire are designed, tested and approved to BS 2037 Class 1. 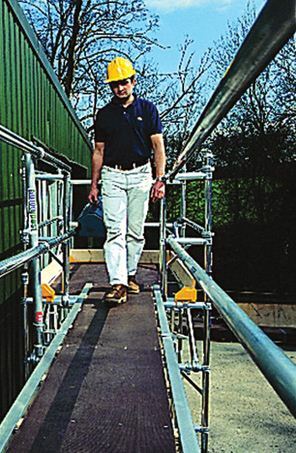 There is a variety of aluminium frame stagings available which offer a safe, uninterrupted work platform that will bridge a gap up to 6.7m without intermediate support. If you are interested in Youngman Boards hire then contact Lakeside-hire for further details.